Today, October 9, 2015, I am introducing my reworked Aluminum Spiral Hair Stick with a Clear Rhinestone inserted in one side of the top of the Hair Stick. This Rhinestone covers one side of the hole necessary to Anodize the Color onto the Aluminum Sticks and add a little "Bling" to the Hair Sticks. 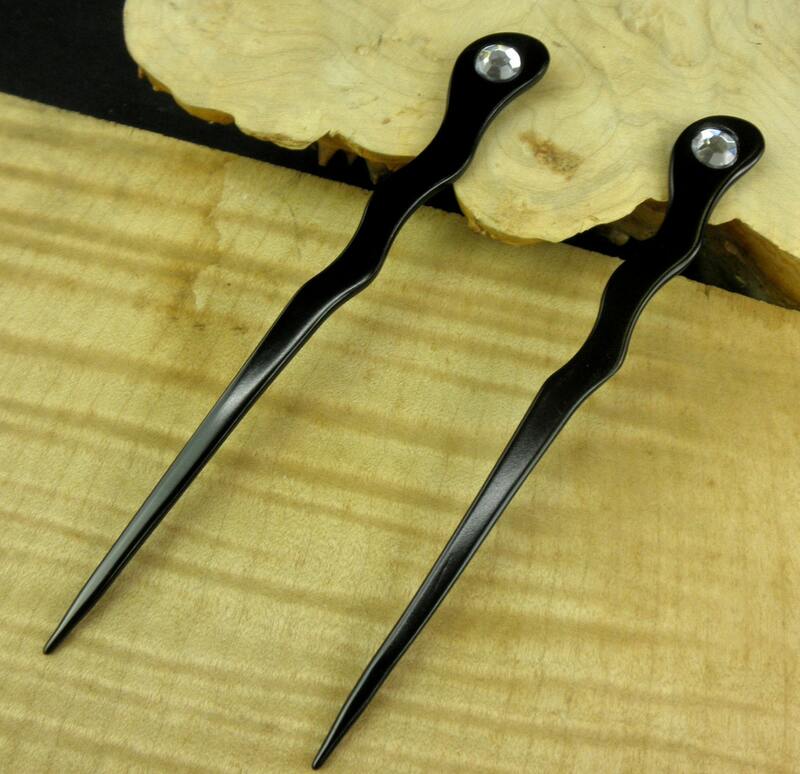 Tired of your wooden Hair Sticks breaking ? This is the end of that problem. The biggest "complaint" or negative comment about Wooden Hair Sticks are that they break. Of course we all know you are not supposed to use hair Sticks as "levers"....but we do anyway. 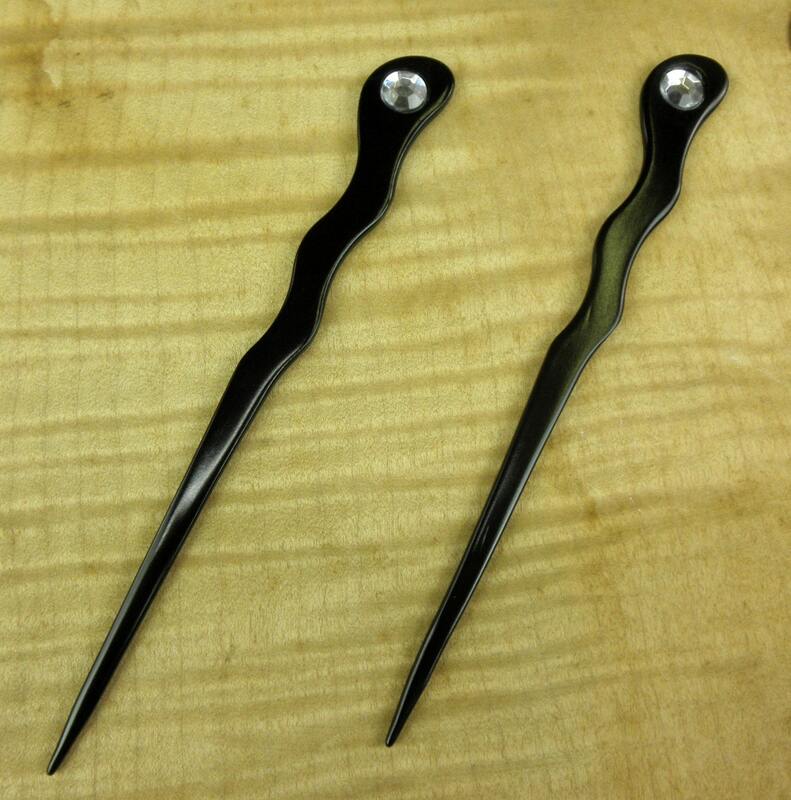 These Aluminum Hair Sticks I have just designed are the same style and size as all of my wooden Spiral Hair Sticks. 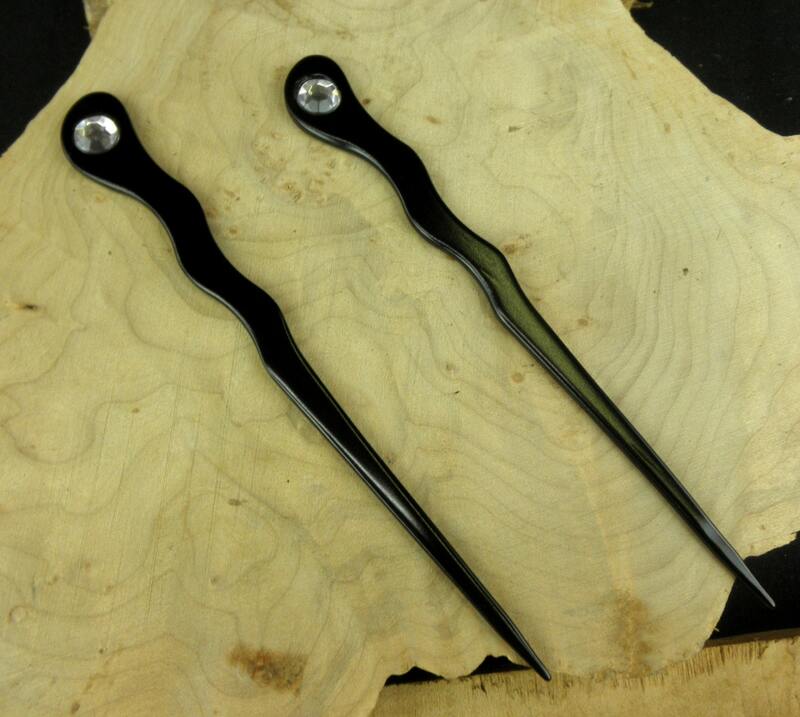 After making them out of Rosewood, Ebony, Yellow Teak, and Regular Teak I have decided to take this proven design and make the toughest Spiral Hair Stick ...An Anodized Colored Aluminum Spiral Hair Stick. 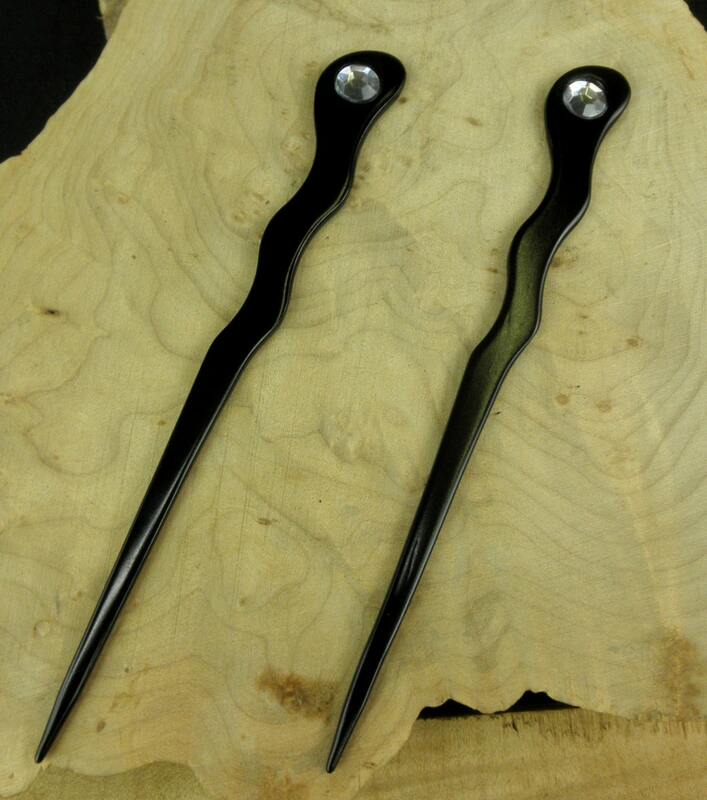 You get TWO Black Anodized Aluminum Spiral Hair Sticks with Clear Rhinestones in this sale !! 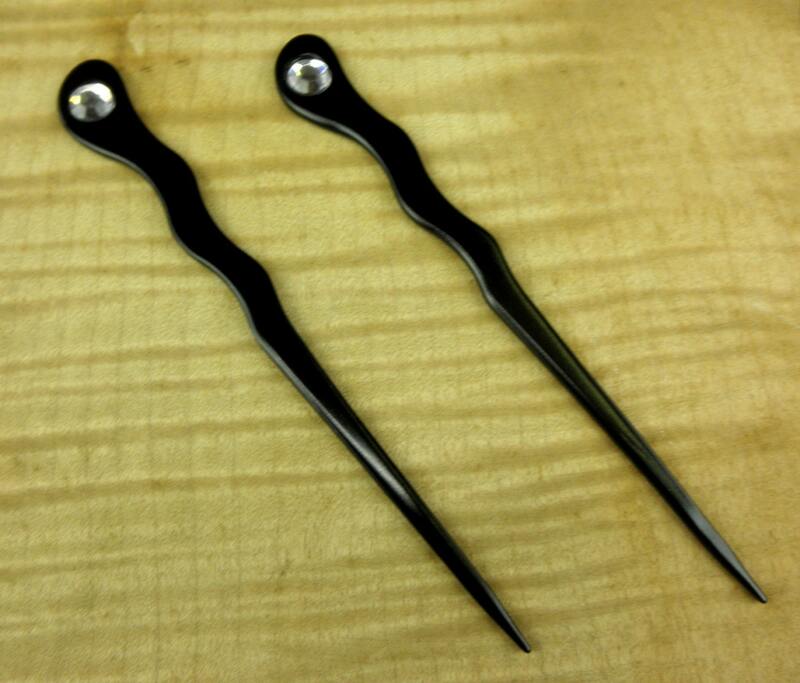 These Aluminum Hair Sticks are 6 1/4" inches long and undulates from 1/2" at the top down to a point. They are a little over 1/8" thick of solid aluminum that has an Anodized Color of either Red, Black, Aqua Blue, Silver, Dark Green or Brown. THESE STICKS ARE STRONG !! They will not break no matter what kind of hair you have. In fact they have been called weapons by some of my colleagues . At this point I should caution you that these are not toys and can be dangerous if your children get their hands on the aluminum sticks. Common sense has to be used with these strong sticks and you can get injured if you fall on the tips of these sticks while running or exercising. The difference between these and wooden sticks is that the wooden stick would probably break but the Aluminum stick will puncture your skin. This Aluminum Spiral Hair Stick is without doubt the strongest Hair Stick I have and probably as strong as any Hair Stick you will find on the market. It is also waterproof and loves to "Shower" !! NOTE: If you do not want the Rhinestone attached you can order one with out the stones but remember there is a recessed area of 10.5 MM in diameter and about 1/16" deep on one side of the Hair Stick that should be covered with something. If you find any of my sticks not to your liking I will take them back. Holds my hair perfectly (for reference, it's about an inch above my elbows) beautiful, solid, delivered swiftly and an extra fork was included in the package as a gift. I love all of them, thank you!